The NHAI has issued a notification that around 275 toll plazas are now considered for FastTag clearance. Which means if you have a FastTag pass, waiting in lengthy toll queues on holiday drives would be a thing of the past for you. Fast Tag is used in many countries and is basically an RFID card or sticker that you put on your windshield. This is automatically scanned by scanners mounted on the toll booth that would deduct a certain amount for every trip you make across a toll booth. You would get SMS notifications for amounts spent as well. The website however does not specify what happens if you try to use a fasttag lane with no amount left on the tag. Only real users who have tried this may wish to comment on ths blog about the same. The company running this operation is called IHMCL (you can read more about them in these articles : http://www.indiantollways.com/category/ihmcl/ ) and it is one of the government concerns managing the show. 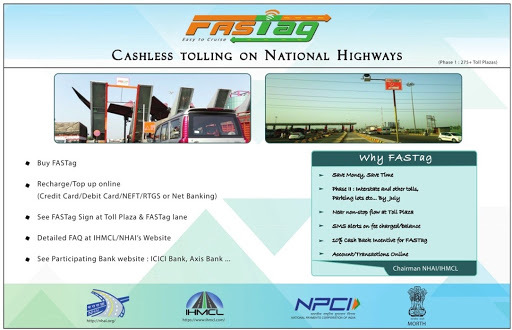 These FastTag cards are available at ICICI or Axis branches which are designated to sell them or in Bangalore at the electronic city toll plaza. So what has your experience been with respect to FastTag, hit the comment section to speak about it.